Volkswagen has reached deal to repurchase or fix nearly 500,000 diesel cars that cheat on emission tests, giving car owners the choice of what to do. No matter what they choose, owners will also receive "substantial" cash compensation for their trouble. Federal Judge Charles Breyer ordered the automaker not to disclose how much money owners will receive while final terms of the deal are being hammered out, but there are widespread reports that the sum is $5,000. The automaker, which admitted to cheating on emissions tests, said the preliminary agreement was reached in round-the-clock negotiations with U.S. environmental regulators, the Justice Department as well as attorneys for the car owners. "VW is committed to winning back the trust of its customers, its dealers, regulators and all Americans," VW attorney Robert Giuffra told the court. "We think [the deal is] good for the consumers, the environment, and good for Volkswagen." Volkswagen so far has only given owners $500 in cash and $500 in store credits. It's also hired attorney Kenneth Feinberg to run a compensation fund for owners. But details of that compensation plan have yet to be decided. But many owners, and even members of Congress, have called on the automaker to buy back the cars from unhappy owners. 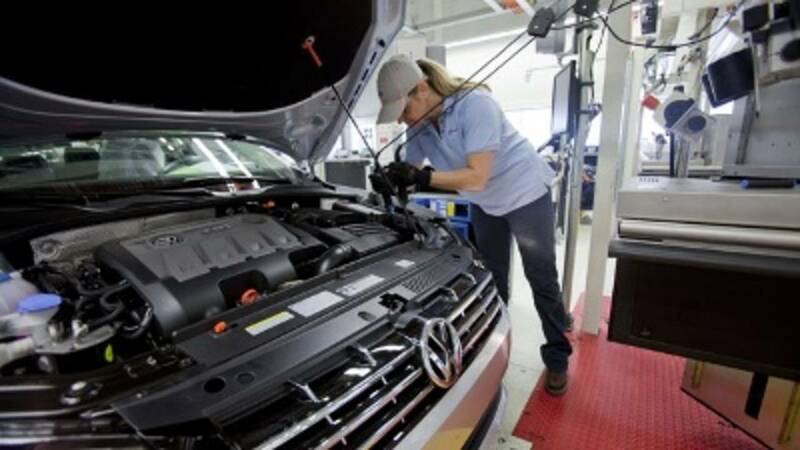 "Finally, Volkswagen appears to have a proposal to take care of customers who purchased its polluting diesel vehicles," said Michelle Krebs, senior analyst with AutoTrader. "It's a critical first step to move Volkswagen forward from this debacle." Last fall regulators announced that VW's diesel cars had software that cheated on emission tests and let cars dump up to 40 times the allowed level of pollutants into the air. VW's CEO and head of its U.S. operations both quit as a result. There are about 11 million of the cars worldwide. VW faces massive fines that could exceed $18 billion for violating the U.S. Clean Air Act, as well as criminal probes and a suit by federal authorities charging it with deceptive advertising that touted "clean diesel" cars. VW is still negotiating with a number of government agencies as to how much money it will pay in fines. The cars covered by this agreement have 2-litre engines and include the VW Jetta, the Beetle and the Golf from model years 2009 through 2015, the Passat from 2014-2015 as well as the Audi A3, model years 2009-2015. The Audi luxury brand is owned by Volkswagen Group. The are also about 90,000 cars with 3-litre diesel engines that aren't covered by this agreement. They include the 2014 VW Touareg, the 2015 Porsche Cayenne, also owned by VW, as well as the 2016 Audi A6 Quattro, A7 Quattro, A8, A8L, and Q5. Breyer said that he anticipates a deal for how to handle those 3-litre cars can be reached "expeditiously." He said he also expects a quick agreement on government fines.